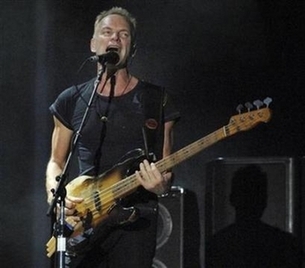 Maybe Sting should start writing more instrumentals. The school teacher-turned-rock star topped Blender's list of the worst lyricists, thanks to lines that betray "mountainous pomposity (and) cloying spirituality," the music magazine said. The survey, contained in the November issue that hits newsstands next week, placed Rush drummer Neil Peart at No. 2, Creed frontman Scott Stapp at No. 3, Oasis guitarist Noel Gallagher at No. 4, and soft-rocker Dan Fogelberg at No. 5. Blender assailed Sting for such alleged sins as name-dropping Russian novelist Vladimir Nabokov in the Police tune "Don't Stand So Close to Me," quoting a Volvo bumper sticker ("If You Love Someone Set Them Free"), and co-opting the works of Chaucer, St. Augustine and Shakespeare. A spokeswoman for the English rocker, who is currently in Belgium on the Police's reunion world tour, did not respond to a request for comment. Blender described Canadian rocker Peart's lyrics as "richly awful tapestries of fantasy and science," and said Gallagher "seemed incapable of following a metaphor through a single line, let alone a whole verse." Further down the ranks, Led Zeppelin frontman Robert Plant (No. 23) was derided for his Tolkienesque musings on Gollum and Mordor in "Ramble On." Carly Simon (No. 31) was mocked for rhyming "yacht," "apricot" and "gavotte" in "You're So Vain." Paul McCartney made No. 38, thanks in part to "Ebony and Ivory," his socially conscious duet with Stevie Wonder. · What can burn the eyes, sting the mouth, yet be consumed?